If you ask anybody on the street what the most important survival items are, you’re most likely going to receive answers such as a knife, canteen, bandana, lighter, food, first aid kit, compass, map, and so forth. Are each of those items useful for survival? Absolutely. But at the same time, there are many important survival related items that people often overlook. Why? Because most of these items are things that we use every day without realizing how valuable they can be when your life is at risk. 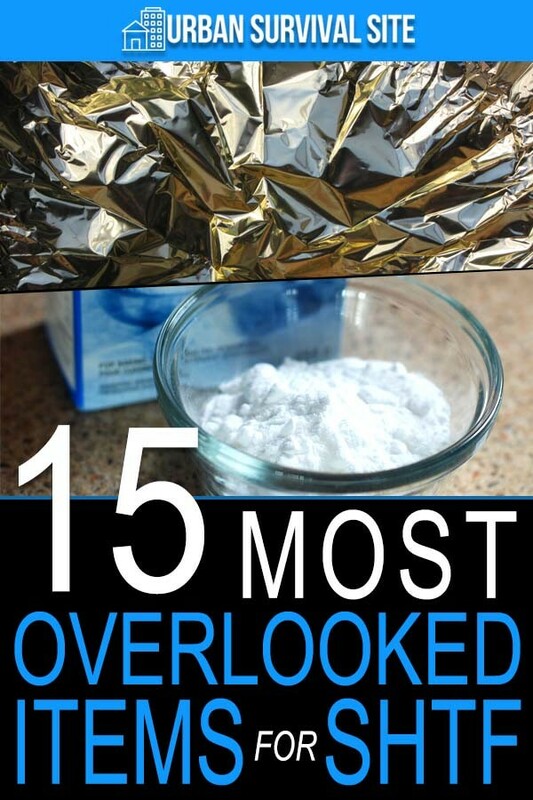 Most kitchens or pantries have at least one roll of aluminum foil stored away somewhere. It’s definitely something that can be put to good use in an SHTF scenario because of it’s incredible versatility. You can use your aluminum foil for everything from wrapping up food for storage to cooking food (place the wrapped up food by some hot coals to cook) to reflecting the sun’s heat to creating an oven in a cardboard box (just line the inside of the box with the foil). And that’s just a few examples. Aluminum foil has many other uses. You might feel weird packing these, especially if you don’t have small children, but baby wipes are a quick and easy solution for cleaning yourself up when there’s no water available or you don’t have much water to spare. Without question, baking soda is one of the most practical and versatile cleaning agents in existence. Don’t believe me? Check out this list of 20 uses. When mixed with water, baking soda can serve the role of each of the following things: soap, shampoo, deodorant, toothpaste, laundry detergent, and dishwashing soap. In addition, baking soda is a very effective deodizer. Sprinkle on your carpet, in your shoes, in your trash can (below the bag), and anywhere else that needs deodorizing. In a major SHTF scenario, chances are you’ll no longer have access to the internet. So how are you supposed to read and research? The answer is simple: go traditional by collecting books. And I’m not just talking about survival books (although here’s a list of the best survival books if you’re interested), I’m talking about anything you personally enjoy from modern to classic novels, religious texts and philosophy books, and anything else you like. Books not only contain valuable information, they can keep you sane in a world without Internet and television. Diseases are going to be far more rampant during a large-scale disaster because of the trash left littering the streets when the garbage collection service is no longer running. And do you know what’s going to get into the garbage? That’s right: bugs. I’m talking flies, mosquitoes, cockroaches, and more. Do you really want all those insects flying and crawling around your home? 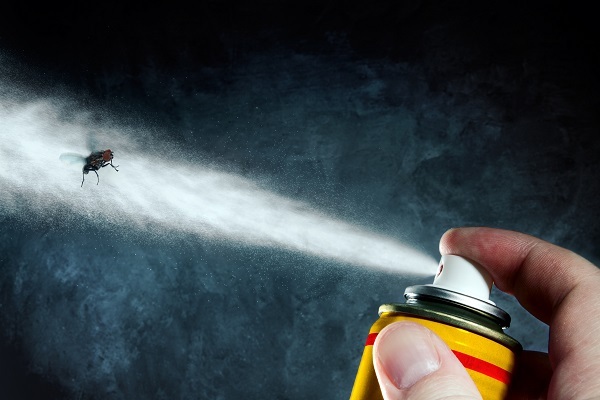 If the answer is no, then you’ll want to have plenty of bug spray on hand, including bug repellents and bug killers. Most lists of survival food don’t include candy, but they really ought to. Not only is candy a good morale booster or dessert to have after a bowl of beans and rice, it’s also an important bartering item. Plus, certain types of candies such as hard candies will stay good for years without any special storage techniques. An even more effective bartering item to have is coffee. After all, two-thirds of Americans drink coffee every day. And when coffee isn’t readily available, some people will be willing to barter important items for it just to stop the incessant headaches. And don’t forget coffee filters either. These things are great because they can be used for filtering other things besides coffee (such as water you scoop up from the creek) or as makeshift napkins and rags. 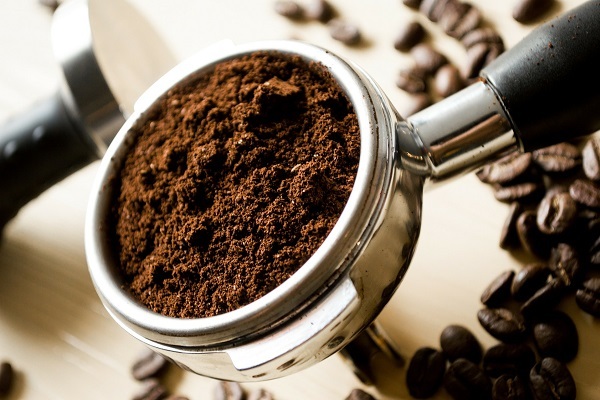 Here are some other uses for coffee filters and grounds to consider. Duct tape is often marketed more as a home utilitarian item over a survival or disaster preparedness item, which is unfortunate because it literally has dozens of survival applications. Seriously, what can duct tape not fix? From torn clothes to ripped backpacks to shoes with holes in them to cracked water bottles to damaged shelters. 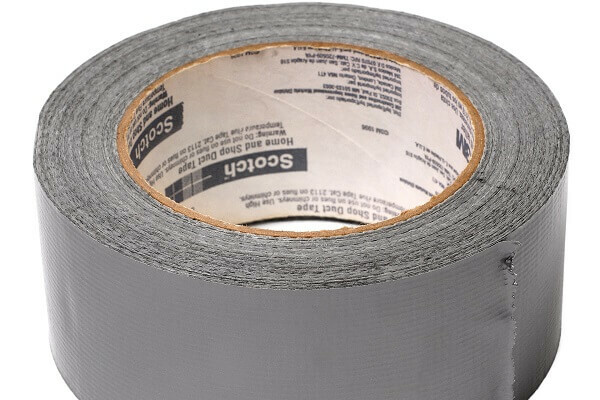 Duct tape can also be used to make splints, slings, bandages, crutches, cordage, and more. In a survival scenario, duct tape will be your best friend. Obviously, dental floss is important for keeping your teeth clean. But you can also use it for fishing, fixing clothes, building shelter, starting a fire, making a perimeter or tripwire around your campsite, or even for making a clothesline if you wrap enough strands together. Here are a few more things you can do with floss. When you can’t watch TV or browse the Internet, games will be the next best form of entertainment when you need to pass the time. Have copies of each of your favorite board games and a few decks of cards as well. (I like these playing cards because they have survival tips on them). And here are some great board games for preppers. 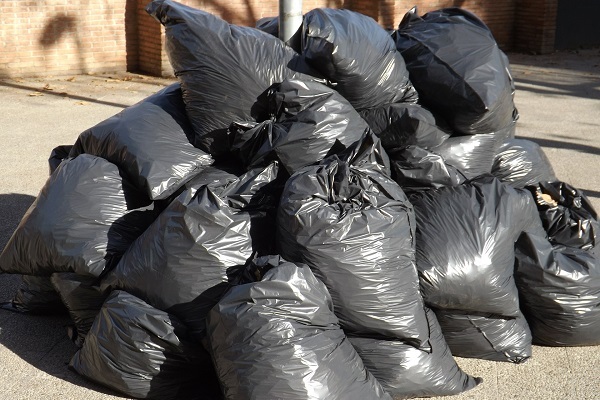 Garbage bags are definitely one of the most important items on this list, not only because you need to do something with all the trash that piles up during a disaster, but also because garbage bags have dozens of survival uses. You can use them to gather supplies, keep things dry, make a tourniquet, make a sling, collect rainwater, take a shower, make a poncho, build a shelter, make a pillow, make a toilet, stop weeds, make a rope, make a blanket, and much more. I recommend getting some large contractor bags. Cleanliness and personal hygiene are going to be very important in the event of a disaster because diseases are going to be running rampant (as I explained above in the section on bug spray). 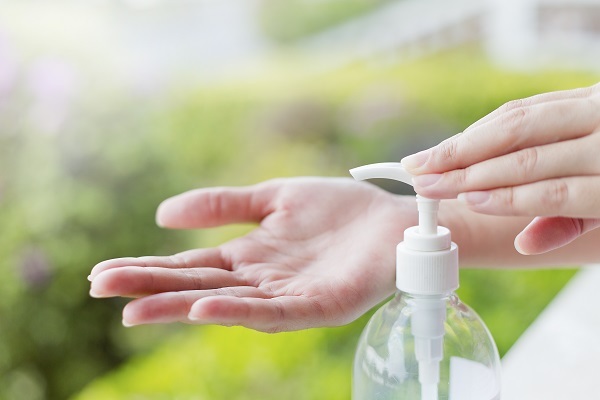 That’s why you should make it a habit to regularly squirt some hand sanitizer onto your hands. In addition, it’s a well-known fact that hand sanitizer is great for helping to start fires because of its high alcohol content. Just light up a match and bring it within the immediate vicinity of the hand sanitizer, and it will catch fire and burn instantly. Here are some more survival uses for hand sanitizer. When a significant enough disaster strikes, such as an EMP attack or solar flare that completely knocks out the power grid, the days of you typing away on your computer or tablet or phone will come to an end, at least for the time being. So to jot down important notes and information, you’re going to need paper and plenty of it (and writing utensils as well). Even if you don’t think you’ll need to take notes on anything, it’s at least worth keeping a journal. A major disaster is an historical event! I like these college ruled spiral notebooks. Pens are fine, but mechanical pencils are better if you’re the type of person who makes a lot of mistakes when writing. Safety pins only cost about 3 cents each, yet they possess a number of valuable survival uses that will come in handy. You can use them as improvised tweezers, to help build a shelter, as a makeshift hook for fishing, for closing large and open wounds, for making a splint for your finger or toe, for attaching items to the outside of your backpack, and more. 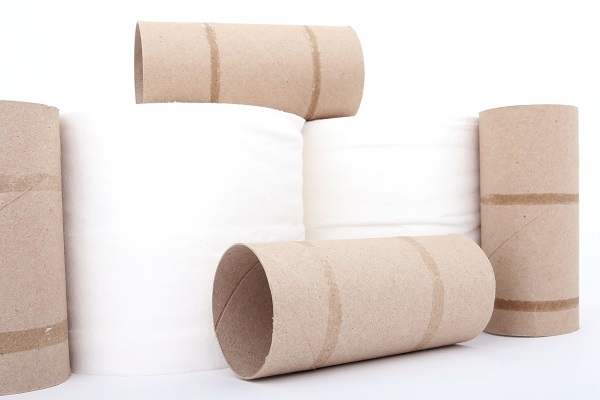 If your current survival stockpile doesn’t have a lot of toilet paper, that’s a problem because you’re going to need it. Probably every day. Furthermore, toilet paper is something that every single person understands the value of, so it will be a critical bartering item to have when things go south. Even if you haven’t overlooked any of the above items, you should get more of them considering how useful they are as barter items and for other survival applications. Are each of these items 100% necessary? Not exactly, but there is no question they will make surviving a disaster a lot easier. When I didn’t see Firearm listed as #1, I knew this was written by a snowflake. When I didn’t see knife / hatchet / tomahawk as #2,3,4 I quit wasting my time. FEMA has an emergency preparedness list on their website. They Don’t list a firearm as well. They do highly recommend a radio, so you can listen to the Gov’t about where to go to get into a FEMA relocation/shelter/food camp. The article is about the “most OVERLOOKED” items. Weapons are rarely overlooked, which is why they didn’t make the list. Snowflakes are people who get upset way too easily, which means you’re more of a snowflake than our writer. Don’t forget about things like nails. Super useful and have defensive capabilities.